Accidents happen, at home, at work and on the road. If you are involved in an accident or collision on your motorbike, you may not know how to handle the situation, or where to turn to for help. Our simple 7-step guide tells you what you need to do if you have a motorbike accident. If the accident happens on a public road, or there are obvious signs injury or significant damage you must call 999 to notify the police. You may also need to ask for an ambulance to attend the scene. Minor prangs, bumps and scratches in car parks or on private land may not require any help from the emergency services, but you will need to exchange insurance details with any other parties involved. First of all, don’t go anywhere! Leaving the scene of an accident is actually an offence under UK law. So, even if your bike is fine and you feel OK, you must stay there until the police have arrived. Get yourself and any passengers to a place of safety, and once out of harm’s way, call 999 immediately. If you have been involved in a high-speed accident, multiple vehicle collision or simply one where it looks pretty serious on the first inspection, you will naturally want to make sure that no-one is hurt. Make sure you and your passenger, if you have one, are unharmed and OK. If your passenger or any other bikers involved are not responsive or appear hurt, DO NOT REMOVE THEIR HELMET. They may have a serious head or spinal injuries that you are not aware of. Only remove the helmet if they appear to be unresponsive and you need to perform emergency CPR. Anyone who is unconscious but appears to be breathing should be put in the recovery position and monitored to ensure that they are breathing until the ambulance arrives at the scene. Of course, most of this will come naturally to the majority of road users.You don’t need to be a skilled first aider to know what to do, but you do need to remember to try and stay as calm as possible. Once the police and ambulance crew are with you, they will take charge of everything. Where possible, you need to help prevent any further dangers arising from the scene of the accident. 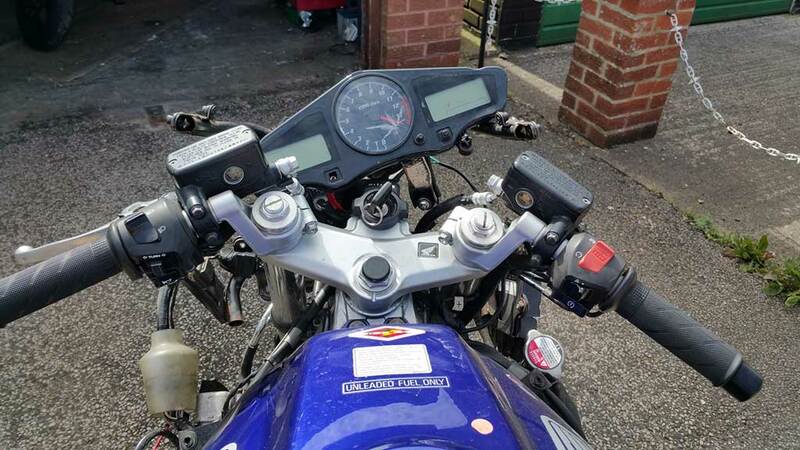 Switch off engines, turn on hazard lights and push your bike out of the road and onto the kerb or hard shoulder to allow traffic to pass safely. It is a legal requirement that all parties exchange their insurance details at the scene of the accident. You will need to make a note of names, addresses and contact number of the other parties involved. You will also need to record the make, model and registration of their bikes or vehicles. Should any party refuse to give their details, you need to make the police aware. If you are unfortunate enough to have an accident on a main road or motorway, the cars rushing past may not be able to stop to give their account of the incident. If however, you have a crash in a busy town centre, residential area or on a country road, you may be able to find witnesses who saw what happened. In some cases, accidents are just that. But usually, one party is at fault and they may try to deny it or change their story a later stage. Any witness to the accident should be prepared to give their contact details and be happy to be called upon by police or insurance companies at a later date. As mentioned before – most road users don’t tend to stop if they witness an accident. Many will honk their horn while you’re still in the road. However, if you have the presence of mind, then grab the first road user who you think was close at the time on the incident and get their details. Even the most minor of prangs can be distressing, and emotions may be running high at the scene. Once you have calmed down a little and the shock has subsided, try to record as much about the incident as possible. You can use your mobile phone to take pictures of road signs, damage to your bike and even hazards that may have caused the accident in the first place. You should also make notes of how the accident happened as clearly as you can, as well as mentioning any mitigating factors including weather and road conditions. All of this information could prove useful if you need to make a claim on your insurance, or if you have a claim made against you. It’s a really good idea to scout around for any CCTV, especially if the person who your accident involved didn’t stop at the scene. If you know the make, model and colour of vehicle, you might be able to finD CCTV within half a mile that will help you build a claim. There is no legal requirement to advise your insurance company from the site of the crash, but you must tell them as soon as you can. You will need to let them know as many details as possible, including the insurance details of any other parties involved. Usually, the matter is now out of your hands as insurers will deal directly with each other. Your insurer should handle everything from making a claim against the other road users involved, to having your bike assessed and repaired if necessary. As we said, accidents do happen. If you ride safely, within the designated speed limits and with respect for other road users, you can help to reduce the risk of being involved in an accident in the first place.